The show is an experiment in ritual and time. Firstly, it will exist in space, minutes, and season. Second, the imprint of participation can last for a long while. Third, someday all present will decompose, geology will take over, and Tribes will have been real. 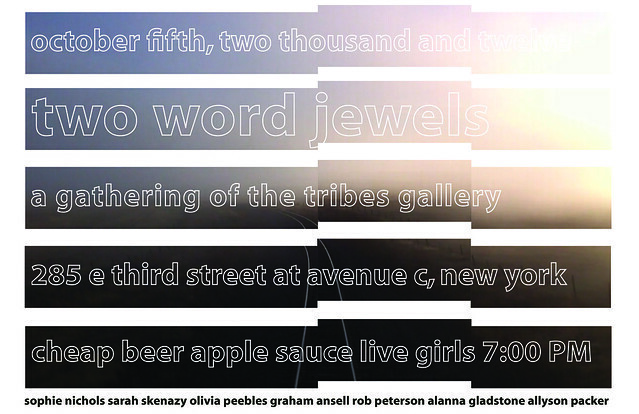 On October 5, 2012 join us for the October 5th of your life, including homemade applesauce, sculpture, sound, light, and cheap beer/live girls. Bring the extra contents of your extra pockets to empty and we’ll turn it into treasure. Collaborating artists include Rob Peterson, Sarah Skenazy, Sophie Nichols, Allyson Packer, Graham Parker Ansell, Olivia Peebles, Moira Connelly, and Jane-Claire Quigley.